The Thomas Fire in Ventura continues to burn. Late reports today claim 20 percent of the 230,000 acre, week-long fire has been contained. But it continues its march toward Santa Barbara where a Santa Ana wind could threaten coastal communities like Summerland and Montecito. Sunset Yesterday. 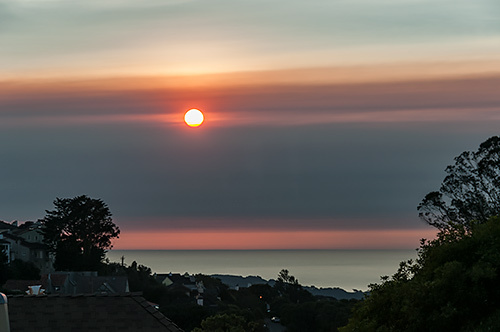 The sun setting behind the smoke in San Francisco. 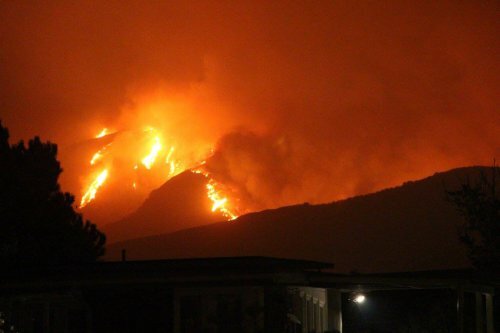 If that sounded far away to us a few days ago, we were reminded how close to home the fire is hitting when we looked out the window yesterday evening. We've seen a red sun setting behind smoke for the past three days. We have family and friends in Santa Barbara and Summerland. Here's a photo from Summerland they shared with us from last night, just after our sunset photo. The fire seems to want to burn inland into the Los Padres National Forest, leaving the urban shoreline alone. But living conditions are still miserable with schools closed until next year. Already 100,000 free masks have been distributed to protect residents from the acrid air. Here's a recent DirectRelief map or the fire, showing evacuation areas to the left, with voluntary zones in ochre. The Thomas Fire. 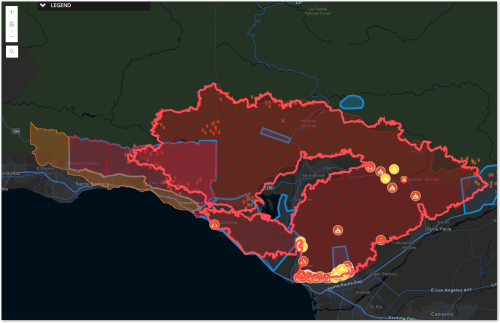 DirectRelief fire map from late this afternoon. The Thomas Fire has already burned the fifth most acreage in California in modern times. The Los Angeles Times explains how it became The Inferno That Won't Die. Family in the area tell us they need a change in the weather to fight the fire. But even then, it could take months to put the Thomas Fire out.